He was a noted enforcer and built like the brick proverbial, but it still breaks Andrew Lomu's heart that injury cut short his NRL career. After a five-year absence, the destructive prop yesterday returned to the game he loves for West Belconnen against Woden Valley in the Canberra Raiders Cup. Lomu, now 33, played 15 games for Canberra across two seasons, before a serious neck injury prompted the Raiders to offload him to Brisbane in 2007. He managed just one game with the Broncos, before being forced to pull the pin. 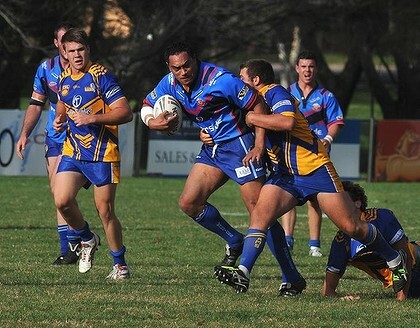 A member of the Roosters' 2002 premiership side, Lomu played rugby union for Gungahlin Eagles the last two years. He returned to the 13-man game to join forces with his nephew Ricky Fulivai, son of former Raiders winger Albert, who played fullback for the Warriors yesterday. Lomu is married to Albert's sister Nusi, and the couple have started a young family. It's the main reason Lomu reluctantly opted to draw an early curtain on his NRL career at just 28 years of age. ''I had my neck fused [at Canberra] and I was never the same after it mentally,'' Lomu said after West Belconnen's 44-10 loss to Woden Valley. ''It's always in the back of your mind and I have a little one now, too. Prior to that I probably would have been a bit reckless [and played on], and not worried about the consequences. ''After we had the little one I had a talk with the missus and I want to be able to run around with the little one, that was the No.1 goal. Lomu said he was convinced quitting the elite level was the right move after chatting with his 2002 premiership teammate Justin Hodges when they were both at Brisbane. ''I think he knew physically I was struggling and probably knew I didn't have the same ruthless mentality I had back then [at the Roosters],'' Lomu said. After pulling off some crunching hits against the Rams, Lomu has clearly re-found his trademark aggression. 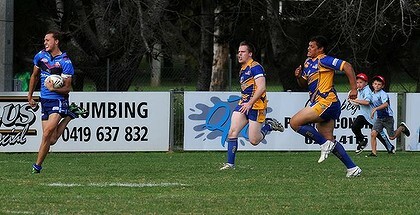 However, led by a 24-point haul from centre Tim Crome, Woden Valley proved far too strong for West Belconnen. 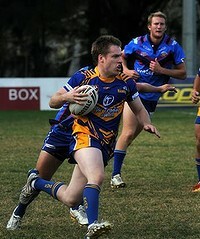 Crome scored three tries and booted six goals in the visitors' eight-tries-to-two win. ''I think it just came off the back of our defence really, we've worked really hard all off-season working hard for each other,'' Crome said. WODEN VALLEY 44 (Tim Crome 3, Mitchell Barbara 2, Corey Hammond, Dane Clarke, Ryan Foley tries; Crome 6 goals) bt WEST BELCONNEN 10 (Brad Smith, Tory Freeman tries; Tom Robbins goal).